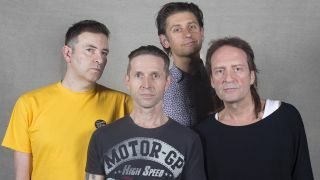 Jesus Jones have announced that their sixth studio album will be out later this year. It’ll be titled Passages and it’s set to arrive on April 20 on CD and LP via Absolute Label Services. It’s the band’s first record since 2001’s London. The lineup consists of vocalist and guitarist Mike Edwards, keyboardist Iain Baker, guitarist Jerry De Borg, bassist Al Doughty and drummer Gen. The band have also announced a run of tour dates which will take place over the coming months, while it’s been revealed that their back catalogue will be reissued later in 2018 via Razor & Tie. Bonus tracks and rarities will be included. Jesus Jones released their debut album Liquidizer in 1989, which featured classic tracks Never Enough and Info Freako. That was followed by 1991’s Doubt which included chart successes International Bright Young Thing, Right Here, Right Now and Real Real Real. Perverse arrived in 1993, with Already launching in 1997 before London was released in 2001. Find the Passages tracklist below, along with the band’s 2018 tour dates. Jesus Jones: "AC/DC is a major part of what we do"